Hey everyone! We’ve been quiet on social media for some time, but for good reason: we were preparing a free update for the Steam Summer Sale. On top of a 25% discount on both the game and the soundtrack, we are bringing a new patch to the Steam version of Light Fall. As we mentioned a month ago, we decided to change a few things in the game after listening to feedback from the community. Precisely, we reworked completely the last boss and improved the way the Lore Journal collectibles (yellow orbs) were presented in the game. On the first point, we felt that the last boss wasn’t quite on par with the rest of the game. We went back to the drawing board and started from scratch. It was important for us to have a fitting last boss for Light Fall. We are very happy with the result and we feel the boss is now more in line with the pace and vibe of the game. We’re still bringing new mechanics to the table, but the fight itself emphasizes what makes Light Fall great: a fast-paced gameplay showcasing your mastery of the Shadow Core. 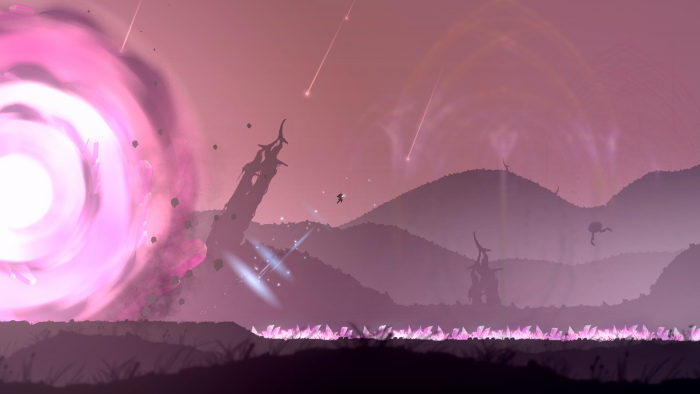 This new end boss is now available, so go try it out and tell us what you think! Here’s a little something to tease you. Uh oh… looks like a lot of trouble. The other thing we spent time working on was the yellow orb collectibles. Initially, a text box would be triggered whenever you brought an orb back to a checkpoint, revealing more details about the universe of the game. After further consideration, we realized that this system would ruin the immersion or even interfere with the game camera at times. As such, we have moved the text box out of the levels. 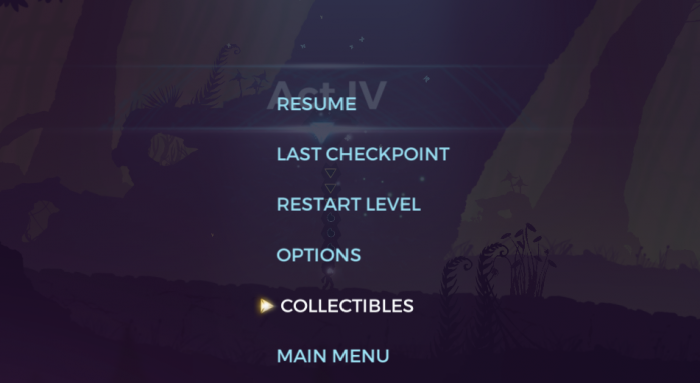 Now, whenever you bring an orb back to a checkpoint, an option will appear providing the choice to read it in a specific menu. 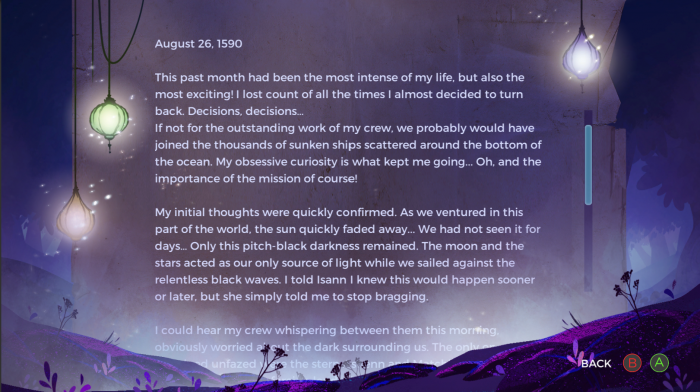 If you don’t feel like reading it on the spot, you can simply resume your journey and check it later in the ‘Collectibles’ section of the menu. The screenshots below will give you an idea of what it looks like now. You can now read the Paddlewood’s Journal collectibles in the ‘Collectibles’ option of the menu. Enjoy the collectibles in this new and much easier to read format. Oh, and you can now scroll up and down at your own pace. 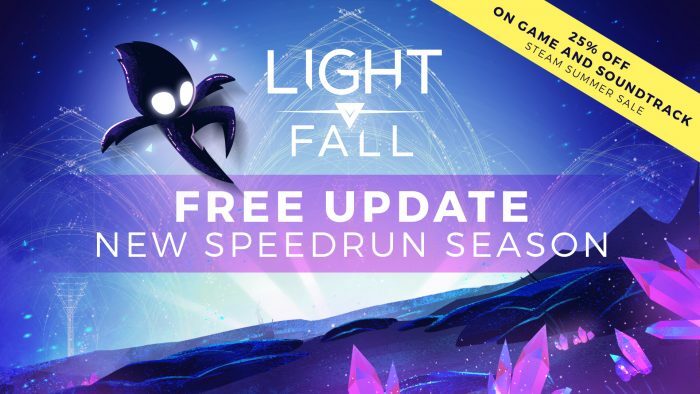 A New Patch Means A New Speedrun Season! With this new patch and its many changes, it made sense to refresh the Speedrun leaderboards to start anew. Doing so, we decided to introduce the concept of Speedrun seasons! It is still possible to check the ranks and times from the previous season, but all the upcoming runs will be saved on a new leaderboard. Congratulations to everyone who competed in the past season! We’re still exploring different ideas for the seasons, but for now, all the times on the leaderboards have been reset. You will also find that quite a few RNG elements of the game have been reduced, making the runs truly about skills now. We’ve also started a Discord channel for everything Light Fall-related. Join us to share your speedrunning strategies or simply to report a bug! You can also read the rest of the patch notes here. Right now, the update is live on Steam exclusively. The reason why we decided to go with Steam first is quite simple: it’s really easy to hotfix a bug or upload a new patch on the spot. On the Switch, the process takes a bit more time. As such, we’d rather make sure that everything is fine on the Steam version before releasing it on another platform. However, rest assured that it shouldn’t be long before the update follows through on the Switch. We will post an update when it’s live. Thanks for the support and for all the feedback you guys have provided since launch. It was truly helpful and we hope you guys enjoy Light Fall even more now! Cheers! That segment with the big pink ball of death has no guides or clues on how to get past it… I’m having a really hard and infuriating time trying to get past it. Any help? Have you tried using the jump pads to your advantage? They will definitely speed your way through the hardest sections!